Hindi is the national language of India, one of the worlds largest and fastest growing countries! Flash cards are an excellent language learning tool. This comprehensive set of flash cards is designed for students, travelers and anyone who wants to learn Hindi. This kit is one of the best ways to learn to read and recognize Hindi words, learn new vocabulary and review and reinforce what you know already. The Hindi Flash Cards Kit has a full range of features designed to help beginning and intermediate learners. 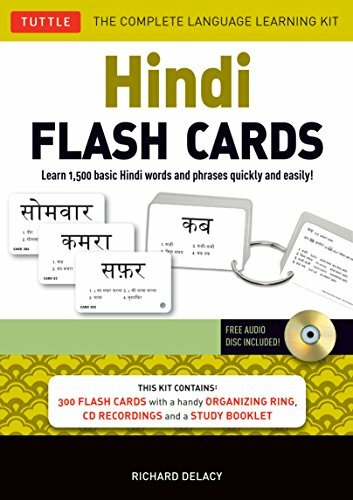 Contains 300 flash cards featuring the most common Hindi words and phrases. Each card has one main vocabulary item plus four other related items. Frequently-used idioms are also given. This set of cards contains over 1,500 words and phrases! Sample Hindi sentences are provided for each main word (in both Hindi script and romanized form) showing you how it is used, with English translations. A handy organizer ring allows you to create smaller sets of cards you can carry around easily in your pocket or purse, to look at when you have spare time. A study guide is included explaining how to use the cards for effective language learning. If you have any questions about this product by Tuttle Publishing, contact us by completing and submitting the form below. If you are looking for a specif part number, please include it with your message.